That is a great pink colour. I also like the idea of using a roller & buttons. Love your pink colour. 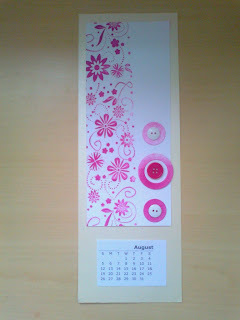 I did think of using buttons but the only use I could think of was a button snake and nothing to do with August. You have captured the month perfectly. Hugs Mrs A. Very pretty, love the buttons. Very summery feel to this Clean & Simple page, love it! Hello Jenni,I love the pink shade and the circles with the buttons on your work! It looks great. Thanks for leaving a comment on my new blog. I appreciate it. 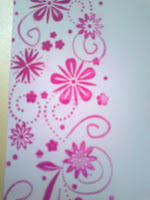 Deep shade of pink is fine! Great calendar page!